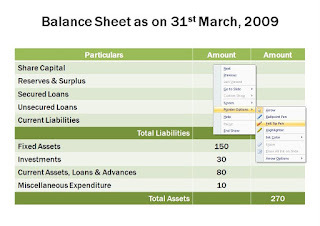 You are presenting the Balance Sheet of the company. This is how your slide looks like. 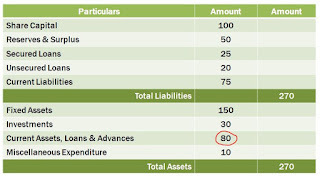 You are making a point about how your Current Assets are just 80 (assume $mn). You feel it is very low and want to draw the attention of the audience towards that particular figure on the slide. You had not thought of it while making your slides. But now you feel you should draw the focus towards it. What do you do? Which one do you use when you have to highlight a point on the slides? Think about it before you read on. 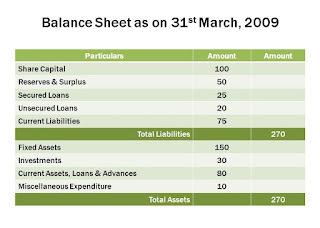 In case, you had thought of it before then you could have used animated boxes/circles/arrows to appear over/near the figure of $80mn. But how do do the same thing impromptu? You can use the feature called 'Pointer Options'. While you are on the slide in Slide show mode, right click on the slide with your mouse pointer. Suppose you choose the Felt Tip Pen. Now, on the slide encircle the figure 80 using left click (the way you normally draw figures in PowerPoint or use MS Paint). After the slide show is over, you can choose to discard or save the figure you have just drawn. 1. When you have to highlight a point impromptu (you had not prepared for it earlier). 2. When the audience is unable to focus on the number (out of a cluttered table for example). Try using this technique in your next presentation and you will definitely find it useful.